The Potteries (Stoke-on-Trent, England) is built on craft and graft as a wise old man once told me. The story of this proud city is a heroic tale of clay, coal and creative entrepreneurship that continues today. The visionaries and workmen behind the Trent and Mersey Canal opened up a voracious worldwide market place for the myriad of ceramic products made in Staffordshire. To this day Potters (people from Stoke-on-Trent) still turn crockery over to look at backstamps. 'Turn-er-over-ers' are looking for the answers to two important questions: "Is it Staffordshire Pottery?" and "which pottery made it?". You will find ceramics made in The Potteries in almost every corner of the world. Contemporary crockery is used by hotels, restaurants and cruise ships across the globe to this day. You will find fine historic examples in international museum collections, historic buildings and public spaces. 'In situ' tiles and architectural ceramics are more difficult to turn over of course and therefore require a bit more research to unpack their fascinating stories. Here is a taster of one of those stories published in 'Glazed Expressions' journal (Tiles & Architectural Ceramics Society). 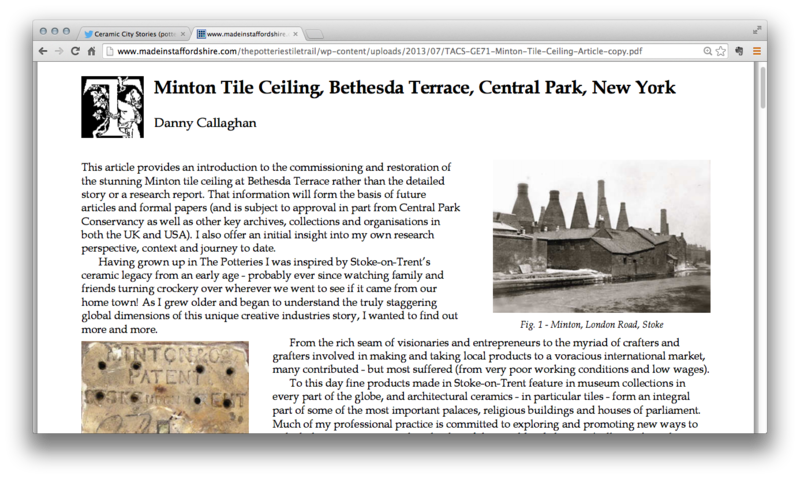 The article focusses on the Minton Tile Ceiling in Bethesda Arcade, Central Park, New York. The research benefited from a TACS' grant in 2012. This support enabled the author to undertake a unique residency with Central Park Conservancy.